Global beverage stabilizers market expected to reach approximately USD 8,664 million by 2024, growing at a CAGR of around 5.6% between 2018 and 2024. The increased functionality and performance of beverages, especially nutritional beverages, are likely to drive the demand for beverage stabilizers in the future. The report covers forecast and analysis for the beverage stabilizers market on a global and regional level. The study provides historical data for 2015 to 2017 along with a forecast from 2018 to 2024 based on revenue (USD Million). The study includes drivers and restraints for the beverage stabilizers market along with the impact they have on the demand over the forecast period. Additionally, the report includes the study of opportunities and threats to the beverage stabilizers market on a global level. To understand the competitive landscape in the market, an analysis of Porter’s Five Forces model for the beverage stabilizers market has also been included. The study encompasses a market attractiveness analysis, wherein all the segments are benchmarked based on their market size, growth rate, and general attractiveness. The study provides a decisive view of the beverage stabilizers market by segmenting the market based on type, application, function, and region. All the segments have been analyzed based on present and future trends and the market is estimated from 2018 to 2024. Based on the type, the global beverage stabilizers market is segmented into xanthan gum, carrageenan, gum Arabic, and CMC. Based on application, the beverage stabilizers market is segmented into fruit drinks, dairy products, and soft drinks. Based on function, the beverage stabilizers market is further segmented into stabilization, texturization, and viscosification. The regional segmentation includes the current and forecast demand for North America, Europe, Asia Pacific, Latin America, and the Middle East and Africa with its further division into major countries including the U.S., Germany, France, UK, China, Japan, India, and Brazil. The detailed description of the companies operating in the global beverage stabilizers market includes parameters such as financial overview, business strategy, key developments, and company overview of the company. 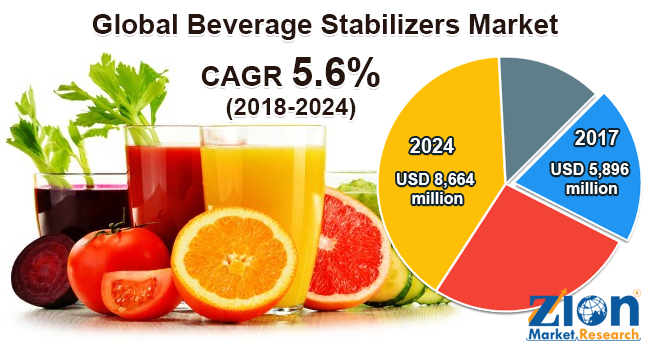 Some key players in the beverage stabilizers market include Glanbia Nutritionals, Cargill Inc., Nexira, Dow Du Pont, Palsgaard, Kerry Group, Advanced Food Systems, Chemelco International, Ashland, and Tate & Lyle, among others.